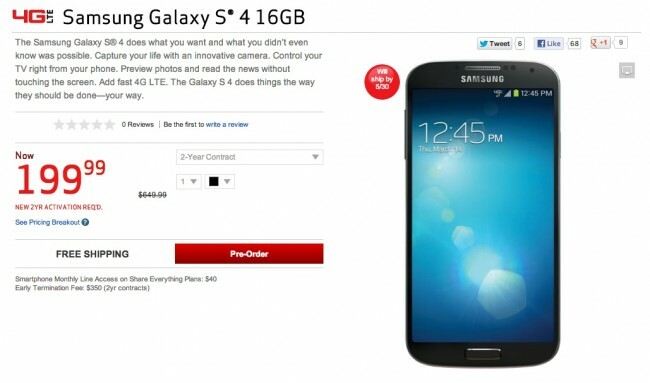 Verizon stuck to their word and has gone ahead and posted a pre-order page for the Samsung Galaxy S4. This is the 16GB model (32GB model no where to be found) in both black and white. If you’d like to pre-order for a device that won’t ship before May 30, this is your chance. At $199, it can be yours with a new contract, or if you’d like to go contract-free, the device will run $649 (ouch). For some reason, the on-contract price keeps changing for me from $199 to $249, which is odd. We’re pretty sure there is a mail-in rebate attached, so you may end up paying $249 up front. Cheers Alan, Michael, @HershelWest, @Banetech, and @JustinL81!